This is a superb apartment, situated right in the centre of Barcelona on the famous Gran Via de les Corts Catalanes street. The location is ideal for those looking to stay in the heart of Barcelona as you´ll be just a short walk from Plaça Espanya, Plaça Catalunya and Las Ramblas, while remaining in the popular Eixample neighbourhood. You´ll also have exceptional public transportation links to the rest of the city, with several bus and metro stops right outside the apartment. The apartment itself is spacious and has a modern décor. Its three bedrooms and two bathrooms make it ideal for large families and groups staying in Barcelona. 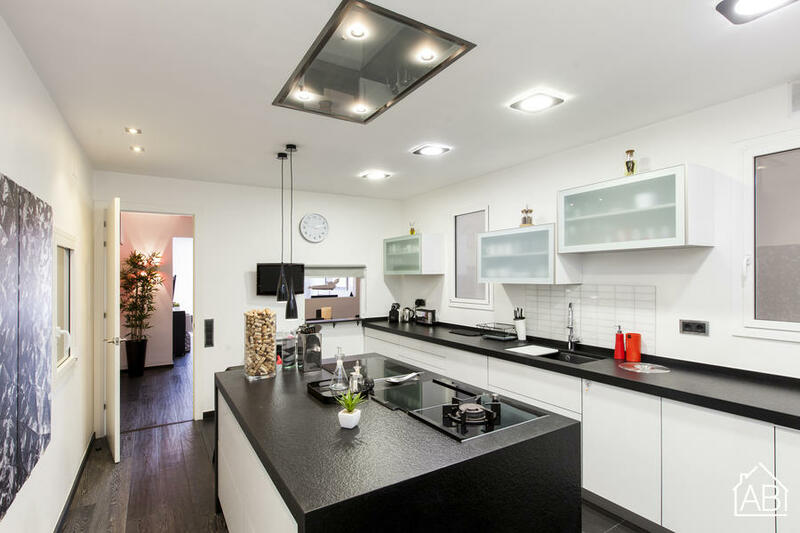 The state-of-the-art kitchen comes complete with utensils and appliances, including a coffee maker, blender and juicer, as well as all pots, pans and cutlery. There is a separate dining room with a large table where you can enjoy your meals. A dishwasher and washing machine add to the convenience of this apartment. You´ll find a TV and DVD player in the apartment, and there is air-conditioning and heating making this a comfortable home-from-home in Barcelona, no matter the time of year. The AB Apartment Barcelona office, open 24 hours a day 7 days a week, is located just 500m from this fantastic apartment. Metro station: Urgell (L1) or Universitat (L1, L2).